Bring home the casual and elegant Louis Philippe bedroom collection. 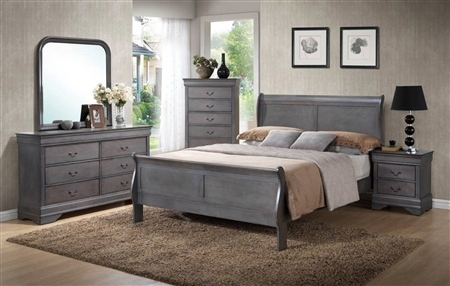 With a warm inviting finish and a rich traditional design, the Driftwood Gray Louis Philippe collection is an exceptional furniture collection that is sure to beautifully transform any bedroom decor. The grey finish flows beautifully over the sleigh bed and sophisticated details to create a bedroom collection that flawlessly captures the essence of grand traditional design but with a rustic feel. With antique silver color finished hardware and beautifully shaped mouldings, this collection will create the bedroom of your dreams. Add a rich traditional style to your home’s decor with the inviting design of the “Driftwood Gray Louis Philippe” bedroom collection.